Here are optional solutions for those with a Sd connect C4 but cannot be connected via LAN (or wifi). when I connect it to the MUX (the 6 batteries are installed) it tries to connect but it gives up after a minute or two and I have a yellow triangle over the network icon in the taskbar. The display doesn’t show the wifi option, only the cable icon. When I start SDConnect Administration Toolkit it says the MUX is not cable accessible. SDConnect relies on broadcasts/multicasts (like the DHCP protocol) to discover SDConnect devices. They can be con completely different subnets and be “detected” but you cannot interrogate or configure them until you get their IP addresses configured for basic management setup. For Connection you´ll need the Toolkit. WLAN is not seen until configured, if you reseted the SDConnect you´ll need to reconfigure it with the Toolkit. You may try forcing your NIC in your laptop to 100Mb/Full Duplex, as many will default and negotiate to 1Gb/s, which I don’t believe some of the SDConnects talk over too well. Also, FWIW, I have been getting an error 750 when trying to communicate to the SDConnect recently. The connection seems very unstable. I have only used a direct Ethernet connection. I have not investigated it very much, but I have resorted to the C3 for right now, which has never failed with 1.2012. I reset it back to factory settings as well. I have not had an opportunity to investigate it to any extent, so I am unsure what the problem may be, but SD NetContol is stating a Network Error to the SD Connect. It is all connected via CAT6 and no WiFi. 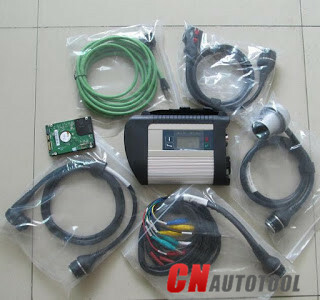 According to customer’s feedback that he failed to access to the diagnostic OBD port when tried to use sd connect c4 read errors code from Benz SRS system. The system prompted an error message “check cable connection/turn ignition on”. The error lies on the SD Connect C4’s battery. 4) Put your positive lead to PIN16 and negative lead to PIN5. 6) Check if the voltage you from PIN16 and PIN 5 is same in step 1. 7) Find the light green wire with a blue tracer band of PIN10 of the OBDII connector. 8) If the voltage differs in step 1 and step 6, the problem is probably with your battery. 9) If the battery is damaged or broken, please replace your battery. I bought “Original Clone Xentry Connect C5” from China’s retail store in 2017/12. I think purchasing this product is still early. There are too many trouble elements. I’ll report it when the situation changes.